I haven’t done one of these challenges for years, figured I’d give this one a try because I would like to work with IRay a little more to see what I can get out of it. I’ll try to upload a WIP soon, need to find a place to save it online as it’s to big to attach. Other images look cool so far. One of the greatest images ever seen! The only thing I don’t like are the bricks on the right: the area among the bricks looks greenish. Hi vaibhavcool83, just post a WIP image up on imageshack, photobucket, flickr or another image hosting site and then post the image link in [IMG] tags in your post. Im considering doing this challenge just so i can learn to light, and by that i mean i don´t know anything about it in 3d, the only experience i have is using GI with vray sun to light some interiors in daylight conditions. and i have a question, should i go with gi or should i try to do it with lots of lights? OK, got my picture online. I don’t think I’ll have time to finish this to enough quality to win any prizes but not really the point. We’ll just see how IRay does. Started getting the Copper colors, the pots/pans need to be darker and I adjusted that for the next shot. So far I am using a real world lighting setup, no fill lights or anything. Just the lights where they should be and let IRay take care of the rest. Comments? Some of the other peoples posts are turning out awesome, great work so far. It’s up to you which methods you want to use. But I personally think these challenges are a great way to try something new and experiment with different techniques. You’ll be able to get feedback and if you’re having any issues someone may be able to help you out. It’s a great place to learn and everyone is friendly and helpful. Minor update. Added a few more materials to the main elements. The floor texture brought the overall lighting level down a bit, but I kind of like the feel to it right now. I need to try to bring out the reds a bit more to make it match the movie colors but I could do that in post if needed. Just a minor tint to pull them out. First try - basic lighting - aiming for daylight through roof opening. Some IES used on artificial lighting above stoves. Second try - Some tweaking to lights - less light flooding to the floor and under kitchen. Reduced reflection and glossiness on original materials. I personallly dont like mirrorlike reflections. Third try - Occlusion added, mid-day temperature added to key light on the “roof” + saturation + bloom effect. This is the actual state of my challgene. I have not change it that much, right now i’m focusing on the materials, very raw, just adjusting reflexions and refractions. I’m not aplying the bokeh effect right now, but definitely I’ll use it. I made basic changes in to composition and changing position in some things. I’m just using two lights it took around 7 min with final gather. Novuh: Nice update. The composition is definitely better than before. There’s some splotches from the Final Gather. It’s especially noticeable on the rolling pin and the wall near the window. I’d like to see some bokeh on the knife and rolling pin on the foreground. They also could use some more fill light, their shading gets very dark on the left side and draws a lot of attention. The copper material is looking more gold than copper. That material would go better on the trim of the stove and for the copper you could tint the reflection with some more red. davidcatpi: Welcome! I’ll give you some feedback about the third image you posted. It’s coming a long nicely. The copper pots and pans could use more saturation to the reflection color. The gold trim on the stoves could also use more red in the reflection. Their seems to be some artifacting on the hood of the right stove. I think there might be some geometry issues and for some reason that hood can’t be smoothed. The black parts of the stove could use less reflection, they’re so reflective that there’s very little black visible. Most of the corners of the are going nearly black and could use some more bounce light. Also, make sure not to use occlusion on lights that are already casting shadows, it can make the image look “dirty”. Sir_Vuclan: Coming along nicely! The copper pots and pans are looking more gold than copper, some more red in the reflection color should take care of that. Looks like some parts of the right stove could use some smoothing. The counter tops are really stealing the show right now because they’re so bright. I’m not sure if that’s just because they have a really bright colored material. The tops of the walls could use some darkening, there would be less bounce light reaching the top of the wall because the stove tops would be blocking the light bouncing back up. Keep at it! nibogt: Coming along nicely. The really bright areas on the wall seem a little unmotivated and draw a lot of attention to it. The copper pots and pans could use some more saturation to their reflection color. It looks like there’s a lot of light coming up from the floor, it’s especially noticeable on the stoves. Underneath the stoves could use some darkening. Keep at it! nitz3D: Welcome back! Glad you’re enjoying this challenge. You’re off to a good start. The hanging pans are looking more like a plastic. If you tint the specular color, increase the reflectivity and decrease the diffuse shading it should start looking more like metal. The interior and exterior exposers don’t seem to be matching yet. I feel like the interior lighting would match better with a dusk sky outside. I think a nice touch would also be a little bit of bokeh on the foreground objects. runejw: Getting better! I’ll give you feedback for the first image in your post. The copper pans could use a lot more saturation in their reflection, it could also be a little more red. The same can be said about the brass trim on the stoves. The trim on the stoves could also be about 90% reflective. The glass bottles could use almost no diffuse color, they should be more transparent and reflective. xtremeindustries: Welcome! You’re off to a good start. The copper pans could use more red and saturation in their reflection. The brick wall on the left looks like it’s missing shadows. If you have lights that aren’t casting shadows they could at least have some occlusion. Otherwise your GI might not be accurate enough. 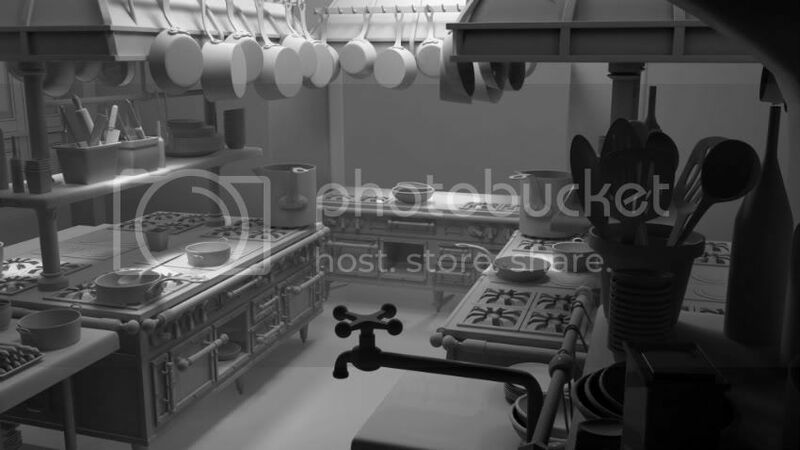 The chrome areas of the scene (the carts, stovetops, faucet) could use almost no diffuse value and very high reflection. Keep going! loicV: Looking great! You’re colors are well on their way to matching your reference image. It looks like there’s some reflection depth issues, the feet of the stoves are missing the reflection of the shadow underneath the stoves. 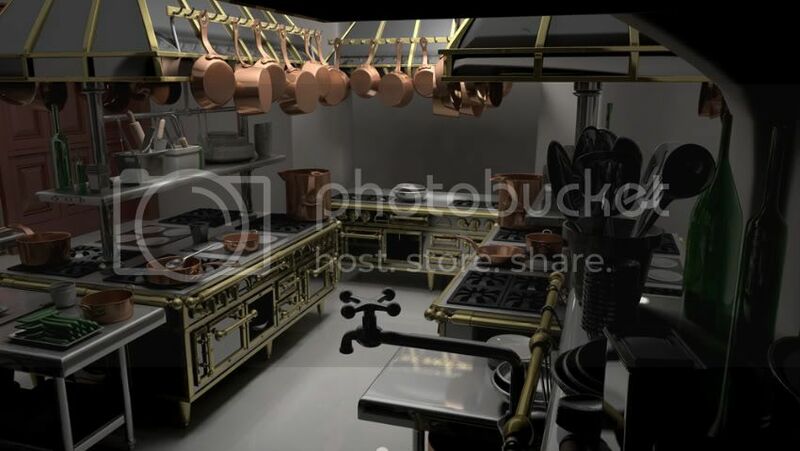 The gold trim on the stoves could use some more red tint instead of being quite so yellow. If you look at the edge of the shadows from The sunlight on the floor you can see that the true color of the sunlight is much more red/orange. It just looks yellow because it’s overbright. The copper pans on the stoves look like they could use a little more red in their reflections. The underside of the hood of the stove is going black on the far side, this could be a trace depth issue, but I’m not sure. Hope to see more! kvdo: Looking great! The copper is looking a little too orange, I think a little more red and a little less saturation might help out. The inside of the stove hoods are getting much brighter than in the reference image. It also looks like the hood has more of a yellow tint in the reference. The poles holding up the stove hoods could use some darkening, especially on the far side. I hope you keep at it! Thanks a lot for the feedback! I tried to apply them but still dont know whats the thing that makes a translucent look on the rear wall, it may be the portal light behind the window, also I will leave the bokeh for last, but it will surely help a lot. Second Upload, added some materials, no textures, only procedural. Added some atmosphere. Thanks for the comments Dan, here is my second approach to the image, already started working some materials and textures. I haven’t applied the bokeh since it renders at lot slower, but here is the general idea. Right now I’m using 2 area lights and one ambient occlusion for the fill lights. nothing to complex, and of course FG. Mainly used IES lights to light the scene and 3 spots. Used light linking (or light groups as they’re called in modo) for bounce light to the arch/ceiling - and also for the vegetables on the tray (dedicated overhead spot and side spot… that definitely can be tuned further ). Hello Dan, and thanks you very much for your feedback, I have been working along with other projects, and I tweaked a bit and combined a little more the lighting for the scene, so now it blends a little bit better, thus enhanced some colors on the foreground and made some “experiments” on the general ambiance. I also went ahead and tried 2 other things, 1. Was trying to see the overall look with the default shaders, just to get a little idea of how I would like to shade this scenario, and 2. Tried a little thing adding some ambient fog to the camera, this allowed the overall look to start smoothing out, also enhanced the foreground making it stand out without crushing the rest of the image. Looking forward your feedback, now I will keep tweaking the lights and begin to work on the shaders.